Clem Labine was a fixture on the Dodgers pitching staff during the entire 1950s decade. From Brooklyn to Los Angeles, Labine stabilized a legendary bullpen as one of the game’s earliest relief specialists. Yet 65 years after his debut, his career achievements remained overshadowed by virtue of being on the same team with Hall of Famers Roy Campanella, Don Drysdale, Sandy Koufax, Pee Wee Reese, Jackie Robinson, and Duke Snider. His fellow bullpen-mate Tommy Lasorda, who made the Hall of Fame as a manager, acknowledge how underrated Labine was amongst his teammates. Richard Elliott, a close friend of Labine’s from Woonsocket, Rhode Island, has finally given the Dodger hurler the spotlight he deserves by authoring a very personal biography, “Clem Labine: Always A Dodger.” They first met well before he was a baseball star, while Labine was a part-time employee during high school at Elliott’s father’s apparel company, Jacob Finkelstein & Sons. A relationship that was forged in the late 1940s between a young kid, his father, and one of Brooklyn’s most beloved pitchers, remained bonded for sixty years until Labine’s 2007 death. Elliott takes us on an unparalleled look inside Labine’s life that could only come from one with such close access to the Dodger great. From the opening of the book, it is evident that this work is much more about relationships than baseball. Labine worked for Elliott’s family throughout the off-seasons of his major league career and well after he threw his final pitcher for the Mets in 1962. With the major league minimum salary currently exceeding $500,000 per year, the type of kinship that Labine and Elliott experienced from the jobs necessitated to supplement the low ballplayer wages of that era may never again be duplicated. Filled with Labine and Elliott’s personal family photos, the images contained give “Always A Dodger,” a feel of looking inside someone’s scrapbook with a rich narrative of the life events surrounding each scene. Along the way, Elliott not only details Labine’s greatest triumphs, but also his toughest tragedies. On the field, Labine was celebrated for his role on two World Series Championship teams, taking home Brooklyn’s only pennant in 1955, and pitching in 1960 with the Pittsburgh Pirates. Yet away from the field, Labine experienced two tremendous losses in a short period of time that haunted him for the rest of his life. His son Jay lost a leg in Vietnam and his wife Barbara passed away from cancer in 1976, only seven years after his son’s terrible injury. Elliot explores the inner struggle that Labine dealt with from being away from his family as a ballplayer. While living the life of a major leaguer on the road seems exciting, these players leave their families behind for a half-year, relying on the strength of a strong wife to carry the household. It was a choice that pulled at Labine well after he retired from baseball. “It troubles me remembering how tortured Clem seemed when he would speak of the compromises to family life which had resulted from his seventeen-year career in professional sports,” Elliott said. While Labine was lauded for his role as the closer in the Dodgers bullpen, two of the greatest games he ever pitched came as a starter for “Dem Bums.” October 3, 1951 is widely recognized in baseball circles for Bobby Thomson’s “Shot Heard ‘Round the World,” off of Ralph Branca, but the primary reason that game even had a chance to be played was due to Labine’s masterful performance the day prior. With the Dodgers’ season on the line, he went nine shutout innings to lead the Dodgers to a 10-0 victory. This clutch feat has been historically overlooked due to Thomson’s aforementioned home run the next day. When the New York Yankees and Brooklyn Dodgers squared off in the 1956 World Series, Don Larsen gave the Yankees a 3-2 series edge when he threw the only perfect game in World Series history. With the Dodgers season on the line, Walter Alston gave the ball to Labine, who was nothing short of spectacular, besting Bob Turley for 10 innings to secure the Dodgers 1-0 victory and a chance to play in Game 7. Overshadowed by Larsen's performance, Labine’s extra inning effort is rarely discussed regarding the 1956 World Series. 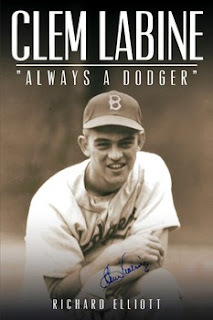 By penning “Always A Dodger,” Elliot ensures that Labine’s career is not only celebrated, but remembered. In the eight years since Labine’s death, Elliott acknowledges that not a day goes by that Labine is not missed. Many baseball fans hope to share just a few moments with a major leaguer at the ballpark or an autograph show, but Elliott had the fortune of spending a lifetime with Labine by his side. The illustration of their relationship in the book captured the essence of the life that he touched. “His childhood hero had become his business associate, close friend, and confident,” he said. * - This article was originally published on Examiner.com October 4, 2015.